The way an IT organization measures and drives traditional infrastructure change is now being challenged by external influences never experienced (nor predicted in IT strategy documents) before. The ‘corporate social’ influences introduced by devices we use, cloud services we collaborate with and applications our customers demand have created a momentum that is forcibly creating a way of working that leaves the IT guys behind. The way organizations are changing the way they use buildings, office space, collaboration areas and underlying supporting technology is now driving a fresh look at how maturity models can be used to drive IT service improvement whist supporting these new ways of working. As we all know as end users the maturity of the ‘corporate social’ technology world is now challenging the immaturity of the internal IT organization. We all experience daily examples where we have ‘if only IT allowed me to do this’. It is like two opposing forces coming together – or more accurately, moving apart as my picture portrays below. This is the basis of this post today. The idea that an organization ( or an individual ) has levels of maturity ( capability ) stretched back decades. For context today it has its origins in the software development world, rising primarily from US DoD military projects that were overrunning budgets and spitting out expensive failed projects. This whole aspect kicked into gear with the publication of the CMMI ( or Capability Maturity Model Integration project ) over at Carnegie Melon university and the Software Engineering Institute. Of course we are only talking about Quality management disciplines which have a bedrock around predictable and repeatable processes that reduce error and increases higher levels output. If engineers can build maturity into their processes and therefore their product output levels why can’t IT engineers? That’s the whole point. A maturity model is a framework to help define the capability of supplier/consultant/engineer/developer/support person, and their ability to use tools and processes that conform to state best practices. These models consist of a number of levels to define this maturity state. Words describe these levels like ad hoc, basic, chaotic, repeatable, defined, rationalised, managed and dynamic. Today there are dozens (probably more ) of maturity models available for a business ( and IT organization ) to develop, baseline and build a roadmap to drive efficiency and optimization around a particular facet of their operations. A simple Google search will suffice. Of course there are many frameworks like ISO 9001, Six Sigma, TOGAF and others that are aimed at providing guidance to an IT organization to improve efficiency and therefore capability. At the end of the day the IT organization is in existence to perform better through streamlining process and measurement to drive out errors, mistakes, time delay and non-delivery to ultimately give the customer a better experience. Anything else is not core. For the technology industry these maturity models abound – all aimed at helping the IT organization establish their Current State (As Is) and their Desired State (to be ). It is said that an organization that has a more mature IT delivery capability will be a more successful organization in business terms against an organization that has less mature processes, people and technology. The light bulb moment dawned a while back that technologies alone will not bring improvements in models, maturity or business operations; no, for this, the business process being powered by technology must also undergo change. This is always the hard bit for IT ‘sellers’ to appreciate however. For at least a decade maturity models have been devoured by leading technology companies and consulting businesses as a way to demonstrate that by ‘upgrading or moving’ to the current platforms on offer ( desktop OS, productivity software, device, cloud platform ) the IT organization will in effect be moving along a well-defined maturity curve, from a less than standardised state to a more standards based state, and even one with examples of rationalised delivery of service to the end user. The annual running cost of managing a PC can dramatically reduce through the deployment of semi-automated task sequences to update and optimize the performance to the organization. This is well documented however too many IT organizations continue to adopt ad hoc and unstructured processes to managing PCs and notebooks, and end up delivering an IT service that is not fit for purpose as people want to use their own devices, have 24 x7 access, expect seamless remote access and have simple ways of requesting new applications. Running a datacentre is a complex operation. Through virtualization a lot of the issues around space, power and cooling should have been addressed but too often the lack of maturity in the IT organization has compromised the benefits by introducing inefficient processes for managing disaster recovery and business continuity scenarios plus the ability to cope with data storage volumes and provisioning line of business application change programmes. Meanwhile the business are off developing new business lines and initiatives that require much higher levels of IT service capacity, and turn increasingly to external services when they see internal IT capability being immature to cope. And the killer compelling event. The ease of technology allowing people to roam around buildings, make smarter issue of interactive devices like whiteboards, the immersive nature of video conferencing and the need to allow heterogeneity of devices is really putting the pressure on the maturity drift. When financial people see the considerable savings in power, space and rent through the introduction of world of work initiatives, plus the staff retention levels increase by offering a better working day through technology services like BYOD, wireless, cloud storage. This matters more than most as talent is often hard to replace and costly and if offering new ways of working can retain talent then its compelling enough. So IT maturity is now even more important than before because new stakeholders are waiting outside the CIOs office – HR Directors and Estates Directors all with initiatives and programmes that need a mature IT service. Now all that is really happening is that these ‘newer’ waves of requirement will eventually be subsumed in to the delivery capability of an IT organization. Won’t it? After all this is what has always happened. Well perhaps we are at some form of crossroads where ‘choice’ will dictate the underlying infrastructure necessary to support the emergence of the ‘shadow IT’. Does an IT organization that clings to the ‘will do what we did last time’ life rift still be afloat? Will they have the direction to change and what compelling events are round the corner. The IT organization now has to take its maturity plans for the core infrastructure and blend it with maturity around digitization strategies, maturity around document management and business process, the impact on paperless environments, maturity around security management and so on. Making sure capability is deep enough to deal with what the business really needs is massive and could potentially expose internal limitations with skills, processes and governance. But what are the alternatives? The risk of not taking this approach is one of marginalization as the time will not be there to go through the way you did it before. Being agile is no longer a cliché for the IT organization. They need it in abundance but perhaps don’t know it yet. 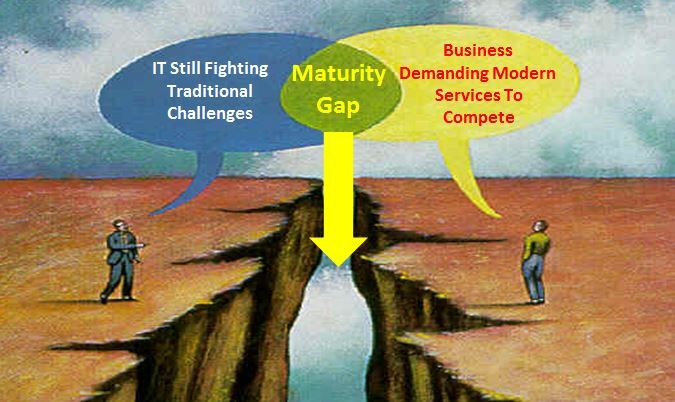 I envisage this because of the increasing release of more disruptive technologies into the social corporate world the discussions around how ‘mature’ each side of the delivery debate will accelerate as the IT organization makes more strategic decisions around cloud, outsource, out-task and blended architectures. I think your post is suggesting a more pragmatic approach because there are many ways of measuring capability and I don’t see we need any more. I run a small IT practice and we often find doing the assessments are one thing but continuously reviewing and optimizing are very difficult for a customer to do hence these maturity discussions sort of die off. Why do you think sir? Yes I believe so…..what seems clear to me is that IT has a new set of challenges that they have never seen before so the old thinking doesn’t work and the speed of transformation of core infrastructure is steeped in capability issues ( opportunities ) that alone are challenging but now with a new wave of social corporate demands it is pushing more dynamic IT in their path ( because mobility and cloud is in effect very dynamic by nature ) and if the IT organization has a less than standardised approach then the clash of culture, capabilities, tools, processes, governance ( maturity basically ) is an expensive battleground with acute pressures and implications. So what do I advocate? A maturity model approach that combines the core IT infrastructure aspects with a world of work ( productivity ) maturity model to give a realistic view of what an organization needs to fix and drive – short, mid and long term. Phew! Hey so is this a tool or a methodology? Paul isn’t the whole maturity model thing dead now? I recall a few years ago it was news but now? I speak to Microsoft and Dell a lot and they don’t talk this way anymore. Has cloud assumed high levels of maturity? If this post is interesting then its worth taking a look at a post put up a while back on the Redmond Magazine site http://redmondmag.com/blogs/it-decision-maker/2012/04/it-maturity-part-1.aspx which discusses what good looks like in a mature IT organization. Admittedly it focuses on the service management aspect it does help ( I hope ) underpin what my post was about albeit with the impact of the new world of work on how to reach maturity and more importantly – keep being mature!!!!!!! Capability Immaturity Model (CIMM) in software engineering is a parody acronym, a semi-serious effort to provide a contrast to the Capability Maturity Model (CMM). The Capability Maturity Model is a five point scale of capability in an organization, ranging from random processes at level 1 to fully defined, managed and optimized processes at level 5. The ability of an organization to carry out its mission on time and within budget is claimed to improve as the CMM level increases.